Sir Walter Raleigh was born at Hayes Barton which is on the edge of Woodbury Common, near the village of East Budleigh, Devon, England. Also see my separate page on Raleigh's attempts at the colonisation of America. He was born in 1552, during a time when his father leased Hayes Barton from the Duke family of Otterton. He was half brother to Sir Humphrey Gilbert and Sir John Gilbert, from his mother's first marriage. He had a brother, Carew, and sister, Margaret. The spelling used in those days was rather erratic and thus "Raleigh" is just one of the (over 40) ways in which his surname was written. He used numerous of these spellings, with "Rawleigh", "Ralegh" and "Rawley" being more often used than the currently accepted version. His name was pronounced "raw lie" and it is said he is never known to have used the modern "Raleigh" spelling. He is known to have attended church in East Budleigh. The nearby sea-side town of Budleigh Salterton is the setting for the painting "The boyhood of Raleigh" by Millais (on show at the Tate Gallery, with more information available in the "Sir Walter Ralegh Room" at the nearby Fairlynch Museum, Budleigh Salterton). Since it was painted in 1870 it's not surprising that the wall still exists. He was quite tall (six foot) considering that the average height was lower then than now. He is said to have retained his strong Devonshire accent during all his time at Court. In those days a regional accent was not such a disadvantage as it has been of late. During his early life, from 1553 to 1558, Queen Mary I was on the throne. This was a time when the Roman Catholic church was in favour. Although a large part of the population had previously become Protestants, those who were most open about it were persecuted. To quote from the "Five English Reformers" by J.C. Ryle in 1890 "Mary was not called "Bloody Mary" without reason.....during the last four years of Queen Mary's reign no less than 288 persons were burnt at the stake for their adhesion to the Protestant faith". Raleigh's parents knew one woman, called Agnes Prest, who was martyred at Exeter. His father narrowly escaped being killed by taking refuge in a church tower. Riots were common, with one at Exeter. It is understandable that Raleigh grew up with a hatred of the Catholic Church and, when Elizabeth I came to the throne in 1558, he was open to express it. In 1581, after seeing action on a number of occasions, he became a favourite of Queen Elizabeth the first. There is little to confirm the famous story of how he spread his cloak across a puddle so that the Queen could walk over it, except for the cloak included in his coat of arms. He became Captain of the Guard and his part in foiling the "Babington" conspiracy ended up with him owning a 42,000 acre estate in Ireland. The "Babington" conspiracy was aimed at replacing Queen Elizabeth with Mary, Queen of Scots. Since she was implicated in it, this led to Mary's execution. Raleigh replaced the chimneys of his Youghal home, with some more like those at his birthplace, Hayes Barton. In 1585 he was made Governor of Jersey. While there, he built "Elizabeth Castle" on a rocky islet, in the 1590s. Other records say he was Governor there between 1600 and 1603 and merely arranged an extension to, and renaming of, the castle. See my separate page on Raleigh's attempts at the colonisation of America which took place at this time. Raleigh arranged for the construction of one of the ships involved in fighting the Armada. 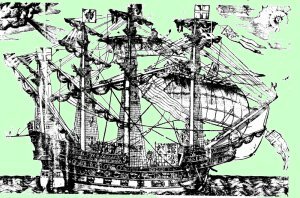 "The Ark Royal" weighed 800 tons and was completed in 1587. It had four masts and a normal crew of 270. The Treasury was very short of money to finance a fleet to fight the Armada. Thus Raleigh donated the ship in exchange for an I.O.U. of £5,000. 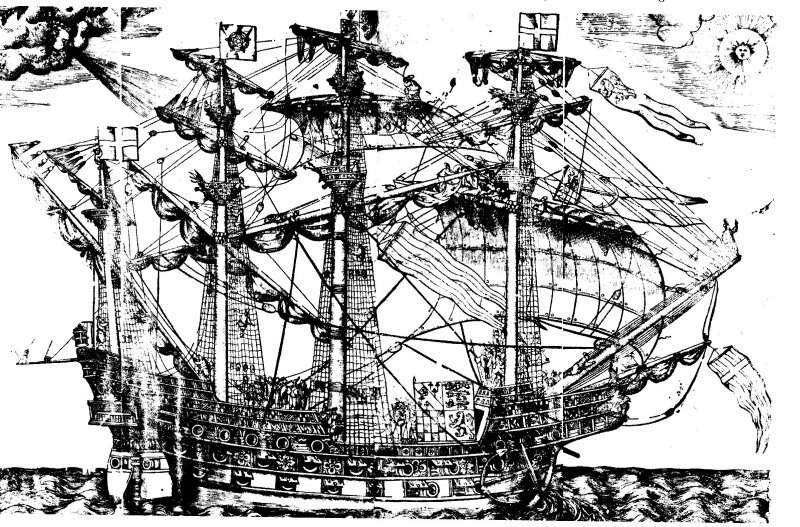 The "Ark Royal" was chosen to lead the English fleet against the Armada in 1588. It was rebuilt in 1608 and renamed "Anne Royal". It was finally sunk due to an accident, in 1636. My thanks to Richard Griffin for the picture on the right. and the fifth (1981 to 2011). If you want to see a reconstruction of a similar (but smaller) vessel, Sir Francis Drake's "Golden Hinde" is berthed in London. In 1588 Sir Richard Grenville and Raleigh took over the joint defense of Devon and Cornwall against the expected Spanish Armada. They arranged the construction of a series of beacons along the coasts. These were to be lit when the Armada was first sighted. As it happened, land-based soldiers did little but watch the sea battles from the coast and guard some Spanish prisoners. He retired to his Irish Estates but then wanted to move again and sold them to Sir Richard Boyle in 1602. Considering the Queen's evident affection for him, it was not unexpected that she should be displeased with his love affair with one of her Maids of Honour, Bessie Throckmorton. The Queen had him thrown in the Tower of London (click here for picture). He was released after one of his ships brought back a huge treasure on the captured Spanish ship "Madre De Dios". He married Bessie and retired to his manor at Sherborne, Dorset. Here he built Sherborne Castle in 1594. From 1617 this has been the home of the Digby family (17th. century Earls of Bristol). In 1603 Queen Elizabeth the first died and James the first took the throne. Raleigh was then framed as a member of a plot against the throne and sentenced to life imprisonment. Whilst in the Bloody Tower he wrote the "History of the World" which was first printed in 1614. It was composed of five volumes but only reached as far as the second Macedonian War in 130 BC. The Devon Heritage Centre at Sowton, Exeter has a number of copies of this book. A particularly fine example from 1617 was "Printed by William Stansby for Walter Burre, and are to be sold at his Shop in Paules Church-yard at the sign of the Crane". In the Preface to the book Raleigh says "How unfit, and how unworthy a choice I have made of my selfe to undertake a worke of this mixture." He goes on to refer to those who put him in the Tower as "ungentle and uncourteous Readers" and thanks them for putting him there "For had it been otherwise, I should hardly have had the leisure, to have made myself a foole in print". Yet again he was released but was then involved in another expedition against the Spanish. Their influence at court managed to have him re-arrested on his previous charge and he was finally sentenced to be beheaded. At his execution in 1618 he asked to see the axe and said "This is a sharp Medicine, but it is a Physician for all Diseases." As was common at the time, his head was embalmed and presented to his wife. She apparently carried it with her at all times until she died 29 years later at the age of 82. The head was finally buried with their son (Carew - like Sir Walter, a one-time Governor of Jersey) alongside the body of Sir Walter to the South side of the alter at St. Margaret's Church. This is just next to Westminster Abbey. It was founded in the 12th century and is the parish church of the House of Parliament. He was also a renowned poet. It is worth noting that spelling in those days was largely free-style and that those who transcribed poems often added their own "improvements". Thus the known words from his poems may well be inaccurate. Here is a link to some of his poems. Anniina Jokinen's page with many links relating to Raleigh and "Essays and Articles on Sixteenth Century Renaissance English Literature". There are many more links on this page. Rich Geib's "Thoughts worth thinking" page with a copy of Raleigh's last letter to his wife. This contains the interesting quote "Begg my dead body which living was denied thee; and either lay it at Sherburne (and if the land continue) or in Exeter-Church, by my Father and Mother". The Luminarium excerpt from the Encyclopedia Britannica entry for Raleigh. Infoplease page based on the Columbia Encyclopedia. A lookup for Raleigh, by the Royal Museums, Greenwich, London. Who2's summary page on Raleigh. Nicholas Hilliard (1547 - 1619) - the Exeter painter who painted one of the most famous paintings of Raleigh. General genealogy (family history) information for Devon. The National Archives search results with a list of locations of documents relating to him. An article with some pictures of a statue of Raleigh in Raleigh City. Book * Sir Walter Ralegh and the Quest for El Dorado Marc Aronson ISBN 0 3958 4827 X. Published by Clarion Books, May 2000. 240 pages. This excellent book is also about maps and how mapping both created and reflected a new way of seeing the world. Winner of the Boston Globe / Horn Book prize for nonfiction for young readers. Book Discoverie of the Large, Rich and Bewtiful Empire of Guiana By Sir Walter Ralegh. Edited, annotated and transcribed by Neil L. Whitehead. Published by University of Oklahoma Press, 1998. Another version of the same. Edited with an introduction, notes & appendixes by V. T. Harlow. Argonaut Press, London 1928. 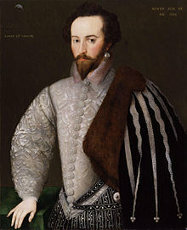 Book Fortune my Foe Geoffrey Trease A biography of Sir Walter Raleigh. First published 1949. His books are normally described as "children's", having a factual background with a fictional main character. Book * The Incredible Armada James Mildren Published by Halsgrove Devon Books, ISBN 0 86114 819 3. Book * Sir Walter Raleigh John Winton ISBN 0 7181 1001 3. Published by Michael Joseph of London, copyright 1975. A large and detailed book. Book * Sir Walter Raleigh Eric Ecclestone Penguin Books. First published 1941. 118 pages, paperback. Book * Raleigh and the British Empire David B. Quinn English Universities Press. First published 1947. 272 pages, hardback. Book * Sir Walter Raleigh A Ladybird Book, for younger children. First published 1957. 51 pages, hardback. Short but well illustrated. Book Sir Walter Raleigh in Ireland Sir John Pope-Hennessy Published London, 1883. Book Sir Francis Drake George Malcolm Thompson Book Club Associates 1972 - this page includes several extracts relating to Raleigh and Grenville. Film Elizabeth Michael Hurst See the Internet Movie DataBase for various films. Director: Shekhar Kapur. Starring: Cate Blanchett. Not very true to history but worth watching. Painting The boyhood of Raleigh Millais Original is at the Tate Gallery. This web site is not responsible for the content of external sites. This page last updated 24th. January 2016. Text © Copyright Jim Batten, 1996-2016.